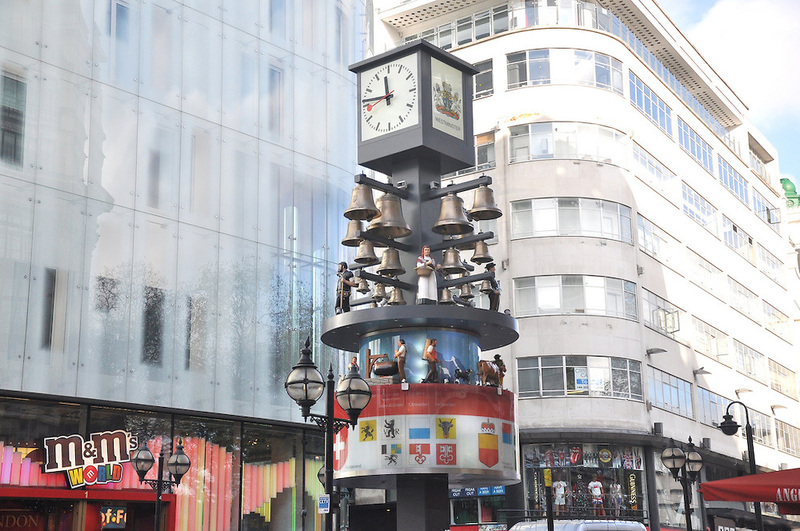 Smith of Derby was asked to design and create the famous glockenspiel clock from a conceptual design. Central to the design was that the clock retained a very strong Swiss identity, but it was also crucial to minimise its bulk and visual appearance in relation to the surrounding buildings and urban context. Working closely with a Swiss consultant, the challenge was to blend the traditional elements with modern wireless technology. 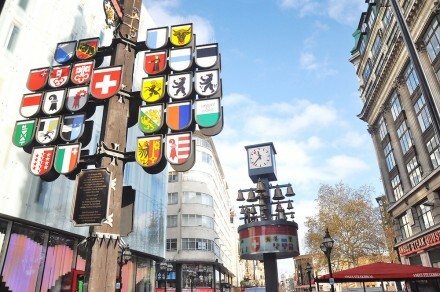 The Glockenspiel is one of the few structures in the UK to contain Swiss time movement. The design is a free-standing totem design. 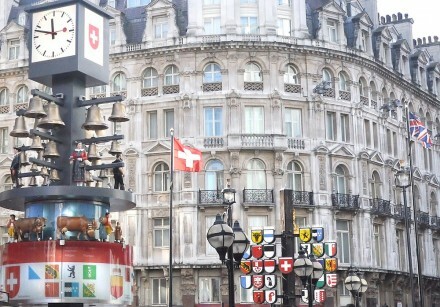 It features 11 moving Swiss figures against a traditional Swiss alpine backdrop, images of the 26 Swiss cantons, 27 bells, 4 Swiss Jacomas representing bell ringers and 2 clocks at the top of the structure. The bells will chime and a five-minute performance takes place five times a day, Monday to Friday, and eight times a day at the weekend. 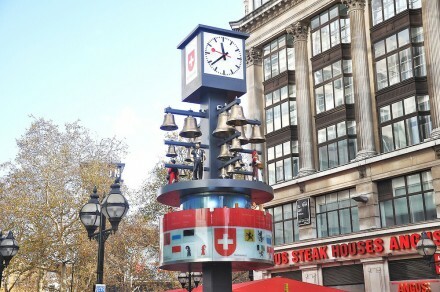 The clock features a unique Swiss time movement, meaning that on the hour the minute hand holds for two minutes before moving on, missing out the one-minute mark. 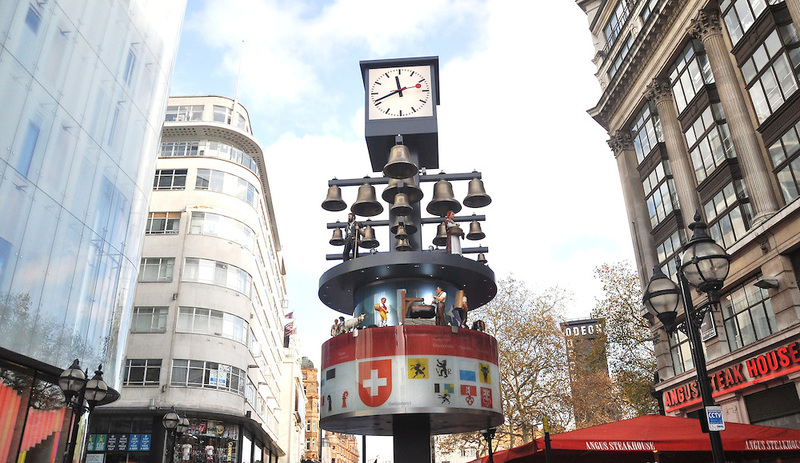 The bells will chime and performances take place 2132 times a year. 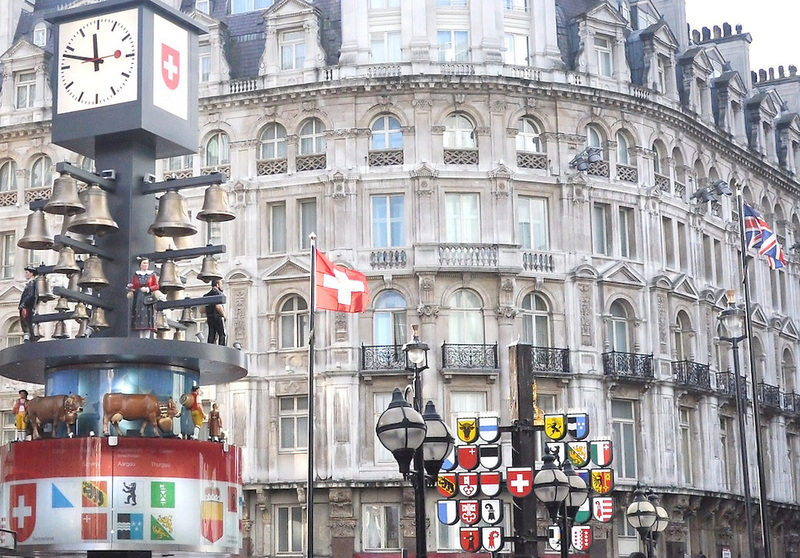 Students of the Royal Academy of Music in London were commissioned to write music for the Glockenspiel performances. 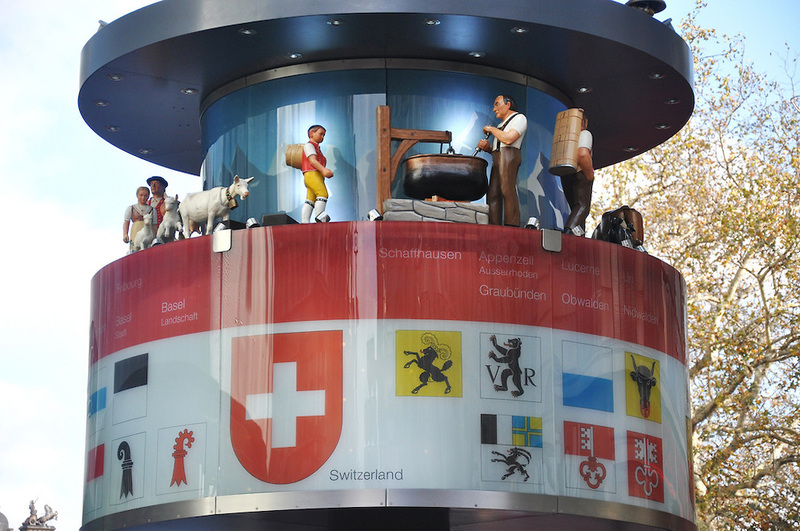 The Glockenspiel features the original bells, Jacomas and processional figures, which have been fully restored by Swiss craftsmen and experts. The Glockenspiel has been designed so it can be played live by ‘plugging in’ a keyboard. 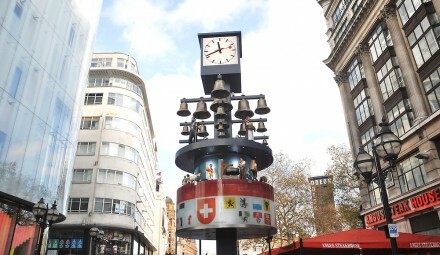 It features 11 moving Swiss figures against a traditional Swiss alpine backdrop, images of the 26 Swiss Cantons, 27 bells, 4 Swiss Jacomas representing bell ringers and 2 clocks at the top of the structure. The design includes a high frequency distress sound system device to deter birds from roosting on the structure. A plaque is installed on the side of the tower giving information about the Glockenspiel, in both the written word and Braille. 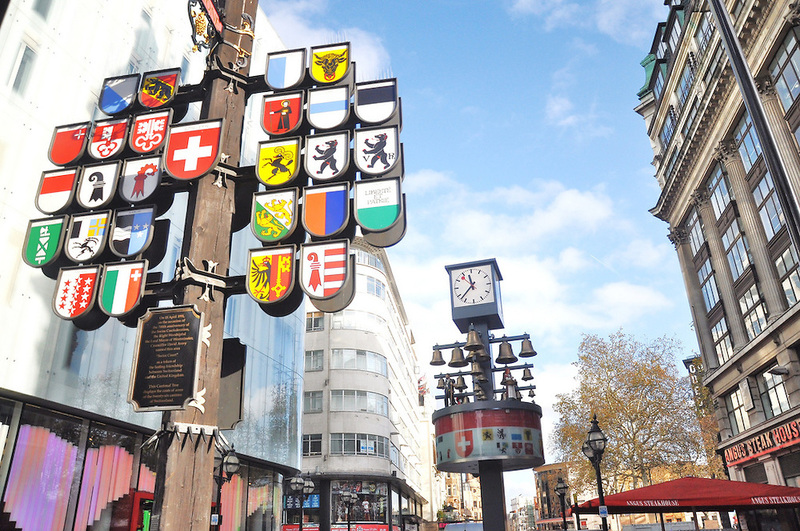 Standing at over 10 metres high and 3 metres wide, it is the tallest Glockenspiel in the country.